I know some people are going to read this and be confused…I thought Thanksgiving was a theme. Sort of, but I have a tendency to attach more specific themes to everything, from decor to birthdays, to Holidays…Christmas, too! (but more on that later). A few years ago, I hosted Thanksgiving for the first time ever, for about 15 people. We ate outdoors (this is Arizona—it was actually kind of hot), so I wanted a fun, but not too casual feel. Sometimes when our gatherings are too big we resort to paper plates. I have a nice set of colorful stoneware (kind of like fiesta ware) I wanted to use, but I didn’t think they looked festive enough, until I came up with my theme: “the fruits of the harvest.” I had to buy a few extra plates (on clearance at Target) and discovered that this time of year, IKEA often sells simple champagne glasses/goblets for something ridiculous like $0.59/each. So I decided it was worth it to stock up on some matching glassware. We did go paper with the napkins, but got the extra large ones from IKEA and stamped a design on one corner. I used a combination of different kinds of pears and apples as the place holders (I think this idea originally came from Martha). I made paper leaves, stamped guests names on them, and punched a hole so the leaf could slide over the stem of the fruit. For the centerpiece I used a cornucopia I had had for a while. I used clippings from a tree in my yard around it. I think I combined some artificial fruit with real fruit (tucking the fake stuff in behind) and nuts, to give the feeling of abundance. You can see the berries in the glasses, carrying on the theme. But what made this fun is that I used the theme to help determine the menu, as well. Nearly everything we made included some kind of fruit or nut in the recipe. I was trying to find the recipe for the green beans (haricots verts) with pomegranate seeds from Martha Stewart, that we made, but instead found this blog, with links to every delicious Thanksgiving recipe you could ever want–many utilizing fruit and/or nuts. I really loved this take on the menu because it was traditional but fresh. Everything had roots in tradition, but nothing was completely ordinary. 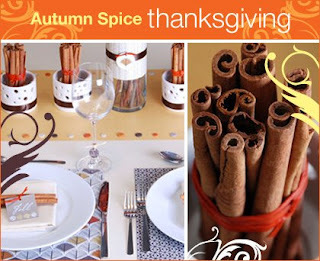 I thought about hosting this year, and if I were hosting, I think the theme would be “Autumn Spice” drawing inspiration from this post (probably less modern, but can’t you see cinnamon sticks tied around candle holders, etc.) and using recipies that incorporate unexpected seasonings. So tell me, am I the only one who uses a theme for Thanksgiving? Themes are great. I only have my mom as a guest, so my husband makes fun of me. But I still do the theme and cute table. This year I’m choosing family. I will have clear plates with photos of the family under them. Maybe I’ll have small picture frames on the table too. I like cinnamon sticks as decor. Thank you for the great ideas adn recipes! I am doing thanksgiving for the first time for everyone this year and I love the ideas! I am so making the apple pecan stuffing…thanks for the recipe! YUM! So lovely! I love horn-o'-plenty! Stop by my blog today and check out mine! I just did a post on it! I would love to hear from you!